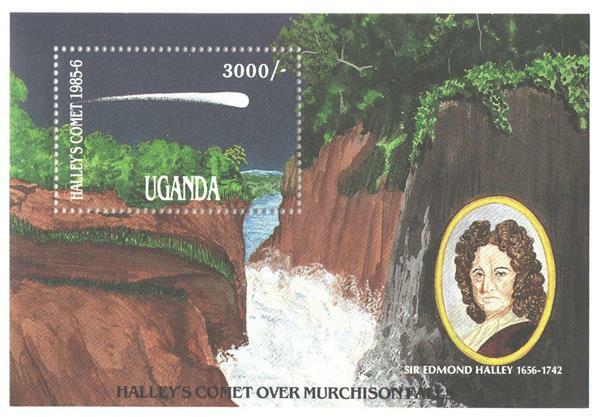 Uganda #489 honors Halley and the 1986 appearance of the comet. On December 25, 1758, Halley’s Comet became the first comet to be seen after accurately predicting its passage. Some of the first recorded sightings of Halley’s Comet date back to 240 BC. The comet was seen and recorded by the Chinese, Babylonians, and medieval Europeans, none of whom recognized it as a reappearance. Rather, they thought they were seeing different comets. 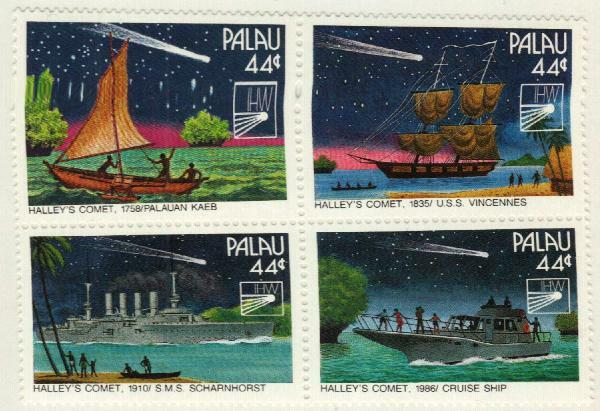 Palau #98a shows Halley’s Comet appearances over the years. Up until the Renaissance, it was believed that comets were disturbances in the Earth’s atmosphere, as suggested by Aristotle. Tycho Brahe disproved this in 1577, though many didn’t believe it. Then in 1687, Isaac Newton, wrote about the laws of gravity and motion and touched on comets. He believed that two comets he saw in 1680 and 1681 were the same comet passing to and from the Sun (he was later proven right). 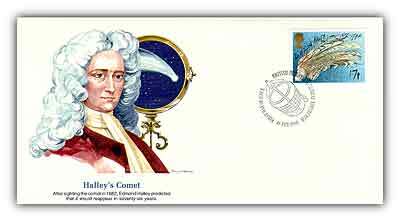 Item #9A1133 – Halley’s Comet commemorative cover. But the most well known name in comets was Newton’s friend, editor, and publisher, Royal Astronomer Sir Edmond Halley. Using the laws outlined by Newton and studying historical accounts, he concluded that the three comets seen in 1531, 1607, and 1682 were in fact the same comet, returning about every 76 years (later studies would reveal it returns every 74 to 79 years). 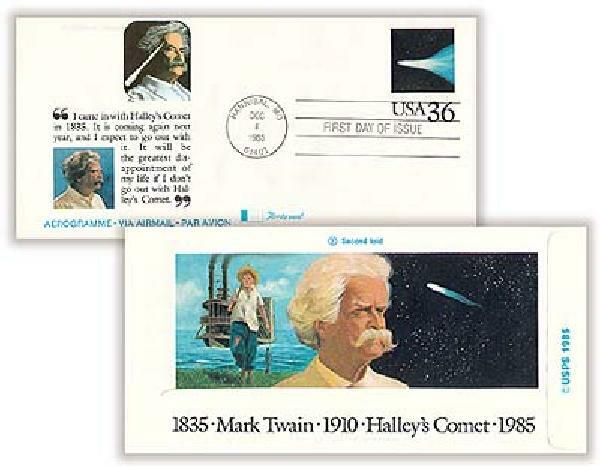 U.S. #UC60 – Mark Twain was born and died within weeks of two appearances of Halley’s Comet. Based on his research and calculations, Halley predicted that the comet would return in 1758. Unfortunately, he died in 1742 and was unable to see if his prediction would come true. Then on December 25, 1758, German farmer and amateur astronomer Johann Georg Palitzsch witnessed the comet’s return, just as Halley had predicted. This marked the first time that any object other than a planet had been shown to orbit the sun. It was also one of the first successful confirmations of Newtonian physics. The following year, the comet was named in Halley’s honor. Halley’s comet was part of another milestone in 1986 – it was the first comet to be studied up close by a spacecraft. That year the Giotto space probe helped planetary scientists study the nucleus and tail of Halley’s comet. The unmanned spacecraft was named after Giotto de Bondone, an Italian Renaissance painter who had observed Halley’s Comet in 1301. When he painted “Adoration of the Magi,” he used the comet as inspiration of his star of Bethlehem. 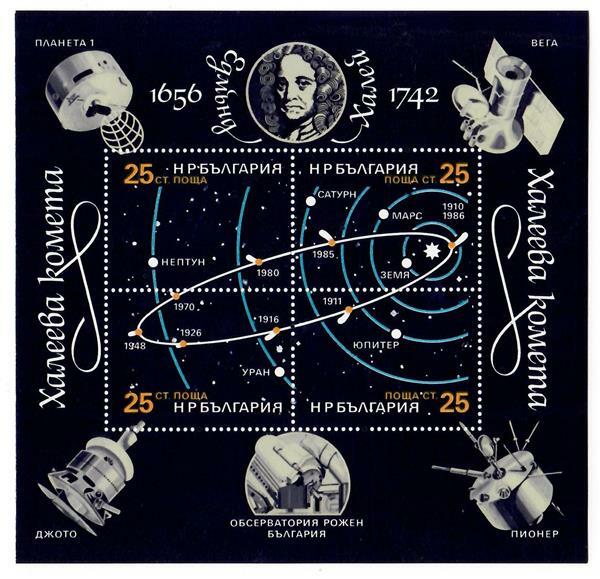 Bulgaria #3153 shows the comet’s path and the probes sent in 1986. The Giotto was part of a group of five space probes launched at the same time called “Halley’s Armada.” In addition to the European Giotto, two were part of the Soviet Union’s Vega program and two were from Japan. The other space probes took measurements that helped guide Giotto close to the nucleus of Halley’s Comet. The Vega 1 and 2 sent images of Halley’s nucleus, which helped direct the Giotto. On March 14, 1986, the Giotto passed about 370 miles from the comet. Before liftoff, the Space Agency believed the probe would not survive the flyby because of particles constantly being sent out from the comet. A new type of dust shield was developed to protect the instruments. Though the probe was knocked off its axis by one large particle, it was able to stabilize itself and return data along with extraordinary pictures of the nucleus to the control center on earth. Laos #729-31 honors Edmond Halley, his comet, and the 1986 mission to study it. After its encounter with Halley’s Comet, the instruments on the Giotto space probe were turned off and it was put into “hibernation.” In 1990, the control facilities in Germany sent a command to wake the spacecraft up. It was then sent to the Grigg-Skjellerup Comet to collect data. This time, the probe was able to get to within 125 miles of this smaller, less active comet. The probe couldn’t send pictures back to earth because the camera had been damaged by particles from Halley’s Comet, but the scientific data collected was helpful in studying and comparing the two comets. Some observations about the make-up of Halley’s Comet were proven by the images sent from the probes, while other ideas were updated based on the new information. 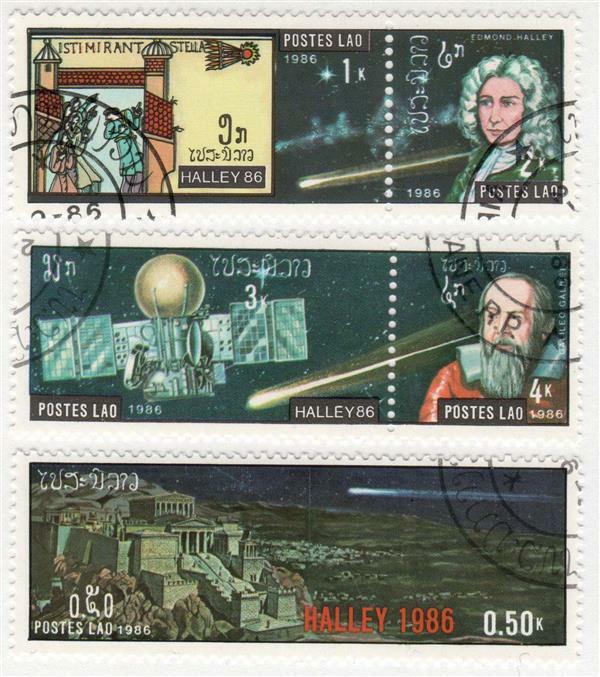 Click here for more Halley’s Comet stamps. Four Decades of Christmas Favorites – get 28 Christmas stamps and save $4.25. Get a complete set of 12 Hanukkah stamps and save $1.85. Click here for more Christmas stamps. This entry was posted in December 2017, This Day in History. Bookmark the permalink. 4 Responses to "This Day in History… December 25, 1758"
This piece is extraordinary Congratulations to the author! Merry Christmas! Like Tom, I studied Halley’s comet in grade school and was very excited about being able to see it but had to wait 30 years. Unlike Tom, for me it was a complete letdown. It had always been depicted as a bright, streaking flash surging across the heavens and it was anything but. What I saw was a murky, shapeless, dim light that looked like its batteries were low. The early projections by astronomers were that this would be the case and that the best place to observe the phenomenon in our area would be an area called Rodman dam, because of its distance from the city lights of Jacksonville, Fl. This pretty much told me that it was not going to be the light show that I had been expecting for 30 years. I observed Kohoutek comet and later Hale-Bopp. Both were more impressive than Sir Edmond’s headliner. I guess if you’ve seen one comet you’ve seen them all. However, in order to keep an open mind, I’ll check out Halley’s next time around and let you know.